The way you layout your WooCommerce website design will help you convert customers. You should take into consideration that people buy and shop in different ways on your site. You have very little time to convince visitors why they should trust and buy from your brand. In this post, we will give suggestion on how to make the most out of the critical seconds you have to entice your customer with these 21 Tips for WooCommerce Website Design. Keep the search bar available at all times. Your visitors want an easy way to find exactly what they are looking for without having to scroll around for a place to search. Make sure there is a search tool prominently displayed at every turn. Filter the results: Have your search be smart. If users type in wood for example. It will pull up all products tagged wood floors. Be prominent: Have your search bar stand out. Design so that it may have a different accent color for the layout and or button. Online shoppers come to your site looking for speed and convenience of shopping. Make navigation as simple but detailed as possible to get them where they need to be. Always place your navigation bars where visitors expect to see them. The standard positions are vertically down the left of the page and horizontally at the top. It’s even better if you can make the horizontal navigation bar remain at the top of the screen as you scroll down the page. You will also need to ensure that your navigation menus will work with any screen size or device. With users shopping from phones, tablets, desktops and a number of other devices, you want the site to react the same and provide the same easy navigation across all platforms. Categorization is key: When looking at your navigation make sure the way you categorize is understandable to the products or services you offer. You have specialty names that new users do not know what they mean. This could make things frustrating to them because you only have a few seconds to get them to react and move on through the buying process. Having a clear and hierarchical structure is important. Make things sticky: We like to have the main navigation sticky so when there is scrolling. The main links are always viewable. If you have tons of products, you try doing a mega nav with sticky navigation. It ok to have several types of navigation: Horizontal main navigation works most of the time. However, horizontal sometimes fits depending on the amount of information you have. Keep in mind you can have several types of navigation based on different areas of the site. As an example, a top bar above the logo can be considered more customer service and shopping related links and icons, the main navigation can be the key services and or sections of the site, and the footer can have all of the above. Non-standard style navigation: The design may feel cool but to an experienced user that is trained. They like to see the same patterns in the user interface because they’re there to buy and learn about your product not be impressed on how well you believe your design is. If in doubt and you want to try something different, test and measure with different styles. Using generic links: If you’re selling product on your site and you only have “Products” on the main nav. You’re selling yourself short a bit because the user needs to find what you’re selling. Try a small top navigation above the logo and then the main navigation with either product categories or the products themselves. Don’t miss the breadcrumb: One of the simplest and most effective tools for usability and SEO are left out sites. Personalizing the experience of your visitors gives them a sense that you are paying attention to their needs and wants. Having related products show on the product page. You may also show them what others have purchased in relation to the items they view. Up-sells: This could be a large quantity, better version, or the same product bundled with another which is displayed in the buying experience to push a higher sale. Related Products: You can have products appear in the product info page, but they are products that are meant to be purchased in addition to the one that the customer is viewing. Cross-sell: You can have items appear on the product page and in the shopping cart to help encourage an impulse to buy. Establishing a long-term cookie when your visitors are shopping so they will have the ability to come back at a later time and pick up where they left off. Life is full of interruptions and you don’t want to lose a sale simply because they forgot what was in their cart at their last visit. They can go straight to checkout to complete the order or with a handy search bar in view, and images of other possible interests in view they may decide to stay and shop a little longer. WooCommerce makes three different types of cookies and already has this built in. The first two cookies contain information about the cart as a whole and helps WooCommerce know when the cart data changes. The final cookie (wp_woocommerce_session_) contains a unique code for each customer so that it knows where to find the cart data in the database for each customer. You may also consider adding Wish Lists to the menu. Wish lists will save an item for the shopper without removing it from inventory on your site. Using the shopping cart as a long term wish list can cause problems with your inventory. Presenting an alternative can alleviate some of this. All online shoppers want to feel safe and secure on your site. Your credentials may be strong but a shopper viewing your site for the first time will be looking for signs that you are indeed credible. The best way to introduce yourself to new customers is to be transparent about your contact information. Displaying your phone number and customer service links in a prominent place on the site will help to put them at ease and reassure them that their credit card information is safe with you. In establishing your credibility nothing is off limits. If you have partners or associates that your guests will recognize, drop those names. If you can show that you are associated with well established and successful companies they are more likely to feel safe shopping on your site. We are certified WooCommerce Experts and proud of it! Carousels have their positive points but they are not SEO friendly. They do help you to show more products and promotions, but they slow your site down and users find them annoying. They move too fast for any real chance to process what is in them. If you must use a carousel, incorporate one that will stop the autorotation when the cursor hovers over it. This gives the customer the opportunity to see the item without actually going to the page with a full description. The best practice is just using static images. Your visitors aren’t interested in bells and whistles. They want great products at the best possible price. Make them feel hungry. The majority of online shoppers will not buy a product until it goes on sale. Prominently display a link to your discounted products so these shoppers will have a direct route to the items they seek. Use a different color for the link or use lettering that draws attention. Bargain shoppers are a great audience to target because they like to tell others what they found at an amazing price. That is free advertising after the sale. Announcing your free shipping in a prominent place on the homepage will help to cut way down on the number of abandoned shopping carts you encounter.Many shoppers will fill their cart only to leave it when they see the insanely high shipping charges. Some will look for your shipping policy before ordering, so make sure you have it in a good position on your page. You will want to offer other shipping options for those customers wanting faster delivery as well. Retail study: 9 out of 10 consumers say free shipping No. 1 incentive to shop online. Provide a link from your homepage to an area devoted to saving money. This includes the free shipping, coupon codes, loyalty points, discounts and any freebies you may offer. You may find that this is the most visited area of your site. The bargain hunters will most likely give you bookmark love for that alone. Add a dedicated sales page: Popular ideas could be the deal of the month/week/day or just creating a page for a one-time holiday special. Avoid clutter on your WooCommerce homepage by using a modal window. Showcase a message of importance without making it a part of the homepage. This frees up space on your storefront for more products. These boxes are only helpful if used properly. They have a bad reputation for containing advertising that was nothing more than annoying. Ensure that you do not overuse them and make the button to close the box readily available. Make sure you have a cookie in place so that a user will not see more than one box per visit and they will not see a box at every visit. Live chat is a great way to immediately address questions, concerns or general doubt that a customer may be having on your WooCommerce store. Very few shoppers will actually call a customer support line and many will leave in frustration. Live chat software is a worthwhile investment to stop buyers doubt in its tracks. Customers get the feeling of a personal touch. 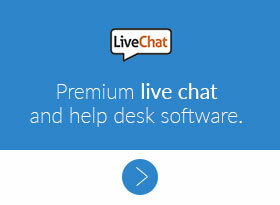 Live chat can provide efficient customer service and prevent lost sales. Trust badges are a good thing but excessive use of them can leave them feeling as though they have a false sense of security. Limit the number of badges you use and make sure they are widely recognized. Overuse can undermine the comfort they should be projecting. Running A/B tests is a great way to decide the most effective way to display your products. This provides two different displays to your customers and over time gives statistics on which works best for your site. Experimenting with A/B testing can greatly improve the experience for the visitor as well as your bottom line. A couple tools we use with our clients: Visual Web Optimizer and Hot Jar. Displaying messages that convey urgency is one way to hook visitors into a sale. If you show them that there are only limited quantities of an item left or make them feel as though their size may disappear soon, they are more likely to go ahead and purchase the item before it’s too late. The trick is to make these messages subtle so they feel like you are doing them a favor when you are ultimately urging them to buy now rather than later or not at all. Give shoppers plenty of opportunities to share your products with friends and family. Make sharing buttons available as well as directly asking them to share. This not only gets your product in front of more people but also your brand and a link to your site. Providing opportunities to share will greatly improve your site traffic and conversions. Don’t take our word for things. Analyze your homepage before making any change to understand where your click saturation, visitor scrolling, and interest is per channel (Bing, Google, Facebook, Etc.). Keep in mind your best-converting channel can be entirely different than your least. You want to make sure you understand first what is going on with your site prior to doing any changes. There are die hard FAQs users out there looking for your Frequently Asked Questions. Provide a link and answer questions as if you were explaining things to a 5-year-old. Information on shipping, warranty, and returns should be included. Also, add questions and answers that you receive on a regular basis to keep your FAQs up to date. This also saves you from having to answer the same questions over and over again. If you’ve been mentioned in the news or have press releases available, include them on the site. Display the logos of the media outlets to be readily recognized by visitors. Most will never read the press release but having it there lends credibility that will foster trust in your site. If you do have media attention, link the logos to any articles about your company. User feedback can be a useful tool in building credibility with your customers. Product reviews, little quotes, thank-you notes or pictures of customers with your product can increase your sales dramatically. You can place these with your product descriptions or in sidebars throughout the site. Using these WooCommerce Web Design tips for your homepage will go a long way toward improving the user experience of your customers while solidifying your credibility and landing more sales. Placing all the vital information where it belongs and displaying the right products can dramatically increase your conversions. Social media shares and good product reviews will improve SEO and drive traffic. Bright Vessel is a certified WooCommerce Expert which can help you build, promote, and improve your storefront. Contact us today.